LEFT BEHIND: What happened to Walter Spence? When Brian Gosizk turned his head from the television set, his best friend was gone. Walter Spence had jumped from his room on the 12th floor of McCormick Hall after pushing out the window screen with the palm of his hand. 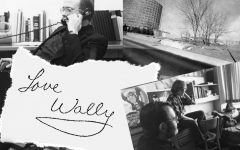 He died from his injuries at Milwaukee County General Hospital April 26, 1978 around … Continue reading LEFT BEHIND: What happened to Walter Spence?